It all started with a phone call saying we were going to the Red River for a chance at the fall greenback run. Not living near the river meant leaving early, 3:30 am early. That wasn't going to be a problem, as this was going to be the first trip on the Red in a boat for the wife and I both. We are mostly shore anglers, so to say we were excited was an understatement. Friday came and all I could think about was our trip the next day. and we were heading south, with time to spare we made it to our first spot somewhere past the Miracle Mile. The aurora borealis were an awesome green and shining in the west, we took this as a good sign, so by the light of our head lamps we baited up. 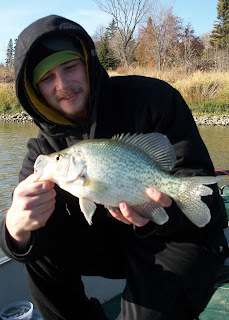 We began to jig using 1/8th to 3/8ths jigheads with salted minnows, it wasn't long before my wife got a sauger and the 2 others with us as well, but not me I had to feed the fish for a while. With daylight breaking the bite picked up, after about a dozen were landed I was worried I was doing something wrong. I tried double hooking the minnows instead of just through the lip and boom game on, first sauger around 15.5 inches, at least I wasn't skunked. The action took off with many double and triple headers, some dinky sauger, some eater sauger, none over 18 inches though. 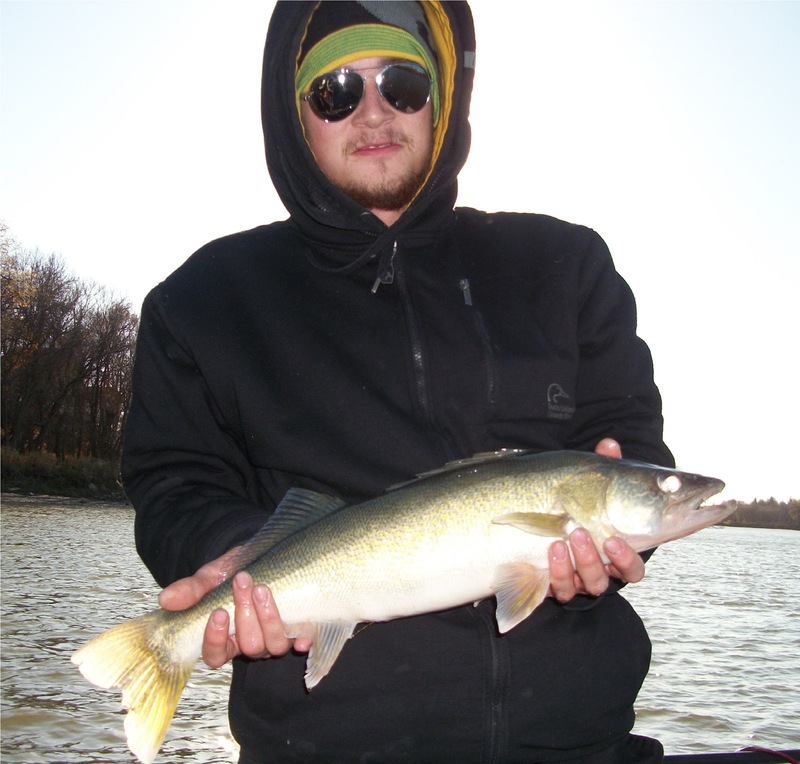 After around the 40th sauger we headed to a new spot to drift and jig some more. We caught some more saugers and repeated the drift and wouldn't you know around the same spot, I get a good hit and the fish below goes for a bit of a run. My heart starts to race and a brief fight ensues, "um i think were gonna need the net" slips out of my mouth and a nice 34 - 36 inch girthy pike reaches the surface near the boat. I know they come way bigger than that but I had never seen one this fat. Our skipper got the net to the water and one look of that net, the pike wanted nothing of it. Off it went on a run I was not prepared for, only for me to not have the drag set properly and boom, without a leader the line was bit and the beast was gone. My heart sunk, instantly reviewing what I could have done differently in my mind, but happy at the same time that we saw it clearly and knew what it was. Some more drifting and jigging until about 12:30, when our skipper and fourth crew member both caught a nice greenback each over 22 inches and under 26, a solid five and a half hours of action so far. you interested in between greenbacks, that person was bang on. 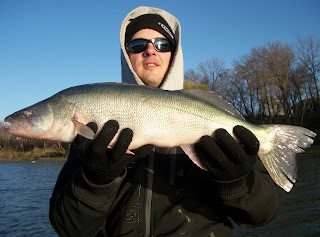 We were finding the fish in 12 to 20 FOW, using chartreuse, pink and black jig heads (greens only on pink). We had used 5 of 10 tubs of minnows so far, so we decided to go for a cruise back to the dock so I could grab the creek chubs that I had left in the cooler, sorry crew. There were tons of boats out on our way back to the dock and by the looks of things, lots of folks catching. The shore anglers were plentiful as well, I couldn't believe how many people were out enjoying the beautiful fall day. After a quick walk to get more bait, wish i could've ran but my sea legs wouldn't allow it, back in the boat and we headed north on the prowl for more greenbacks. Past the group at Sugar Island we tried a couple spots but the wind wasn't pleasant, my wife and I could have dressed better. Not as much action on the finder and way less visible bait. A few sauger caught and we decided to head back south to Seagull Rock, less wind and a lot more bites. Drifting and jigging the fish had moved to 15 - 20 FOW, we were using the other 5 tubs of minnows, some creek chubs, and some gulp products, all were producing well. We caught a bunch more sauger jigging off the bottom and around the same spot where our bigger greenback was caught and the pike lost, our fourth crew member gets a 13.5 inch black crappie, and our skipper gets his first burbot, just a baby. It was a nice surprise and something different, it's always good to see multiple species, I will take numbers and variety over a few fish caught. 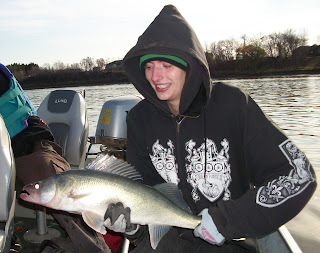 A few more greenbacks boated (mine was the smallest) and tons of sauger, 2 goldeye as well. We watched the sun slowly crawling to the west as we continued to fish on, and as it lowered behind the treeline we made our last drift. Some more sauger and the sun was gone. The bite was awesome all day, there really wasn't a dull moment. Our time to leave had come and we headed back to the dock to load up and head home. year and I can't express how thankful I am for the opportunity to be out on the Red like that.